This is the 50th anniversary of the assassination of Dr. Martin Luther King, one of the most important political and spiritual leaders of our time. So far, none of the media I have listened to has mentioned anything at all about one of the most obvious conspiracies in American history, the murder and cover-up of Dr. King by the U.S. government. 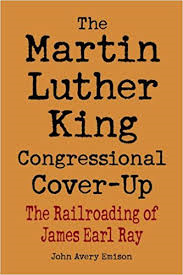 “The Martin Luther King Congressional Cover-Up – The railroading of James Earl Ray” by John Avery Emison is a good example of solid research into the case – implicating government, military and intelligence officials. Emison doesn’t pull punches, he names names. Emison actually has family members that investigated the case, so he has “skin in the game”. He bases contributions to the book on work by Harold Weisberg, Mark Lane, Philip H. Melanson, and William Pepper (p. 12). Weisberg described James Earl Ray as “a decoy”. Lane borrowed from the emerging House Select Committee on Assassinations. Melanson described Canadian and American intelligence agency involvement, including actions by James J. Angleton of the CIA’s counterintelligence division. William Pepper has done fantastic work on the case, representing the King family. Some researchers suggest Pepper may have stretched credibility however, as he describes questionable events as king died in the hospital and the possible identity of a CIA handler named “Raoul”. At this point I’ll give Pepper the benefit of the doubt and accept his account. Emison builds a strong case that many CIA assets and agents were manipulating James Earl Ray and he details the connection between President Johnson and Justice officials in Tennessee. King’s organizing skills were supreme; he had the ability to foster a non-violent resistance that threatened the very core of the military-industrial complex. 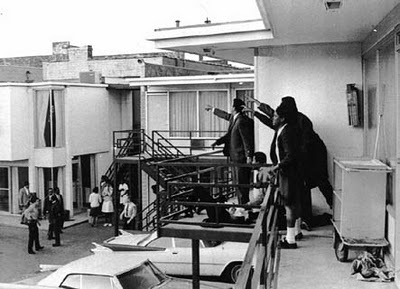 On April 4th 1968 King was gunned down on the deck of the Lorraine Motel, allegedly by a drifter named James Earl Ray. Nothing could be further from the truth. Emison pulls together facts that demonstrate how Ray was set up and his trial was sabotaged. Top intelligence officials thought King would call for black soldiers in Vietnam to lay down their weapons and refuse to fight. Further, he might advise them not even to register for the draft. With antiwar sentiments running high, this could cause a complete societal breakdown. They considered King to be a Communist, and a threat to national security. Accused killer James Earl Ray traveled the world with lots of money for 15 months. He bought a Ford Mustang, cameras and audio equipment, took dancing lessons, bought expensive rifles, had plastic surgery and talked with a therapist. There is no way a half-witted jailhouse liar could have done this on his own. Ray used the aliases of four Toronto-area men including a policemen and one holding a high security clearance. Emison writes “The entire situation of Ray’s aliases speaks of professional intelligence and security expertise”. Emison continues; “FBI counterintelligence was actively manipulating the King entourage into staying at The Lorraine Motel, and FBI informants even reported the room number, 306, in advance. This information was undoubtedly shared with James Angleton’s CIA counterintelligence, but not even the Memphis police department knew until King arrived. Nobody ever saw James Earl Ray bring a rifle into the alleged “snipers nest”, there were no fingerprints and nobody saw him dispose of the weapon. In fact, storekeeper Guy Canipe stated that the green bed sheet wrapped around the Remington 30.06 and other possessions belonging to Ray was dropped at his storefront before the assassination. People may be familiar with the story of Ray’s handler, a mysterious character named “Raoul”. Raoul is described as a Hispanic man who wore an army jacket. That jacket, which did not fit Ray, was found in the trunk of Ray’s Mustang. The first rifle Ray bought was a .243 caliber. Raoul sent him back to get the rifle needed to fit the scenario- a Remington 30.06. Wednesday April 3 1968 was the first day Ray spent in Memphis. Ray said he gave the rifle (the 30.06) to Raoul that evening and that was the last time it was in his possession (p. 229). Emison builds a strong case that James Angleton (CIA counterintelligence) arraigned cover to set Ray up and provides a convincing list of operatives involved on page 259. There are clear links to the Kennedy assassination in this list of contacts. Drop all this information into the segregated south, seething with prejudice and violence. The U.S. Army had started a file on King in 1947, suspecting Communist links. In fact, the Army was using Green Berets to scout landing zones for riot troops as well as sniper sites. Special Forces from Vietnam were moved into the Alabama National Guard. “Birmingham became Saigon. The rural south was in-country and at times things got out of hand”. Emison’s “The Martin Luther King Congressional Cover-Up” is a great primer on the case and some new facts are uncovered. James Earl Ray was the perfect “Patsy” who had been profiled for his use and disposed of at trial. In this instance, the government was far less messy than in other assassinations, there was no need for a Jack Ruby in the basement of a police garage. This entry was posted on April 4, 2018 at 6:40 pm and is filed under Book review, Tell the truth and run !. You can follow any responses to this entry through the RSS 2.0 feed.